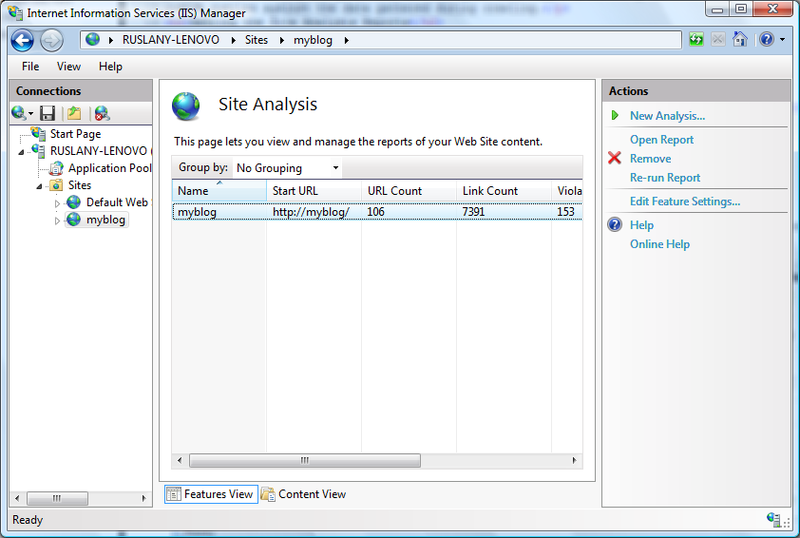 IIS Site Analysis is a tool within the IIS Search Engine Optimization Toolkit that can be used to analyze Web sites with the purpose of optimizing the site's content, structure, and URLs for search engine crawlers. In addition, the tool can be used to discover and fix common problems in site content that negatively affect the site user experience. The IIS Site Analysis tool includes a user interface that offers a comprehensive set of pre-built reports for Search Engine Optimization (SEO) and displays content-specific problems found during analysis. 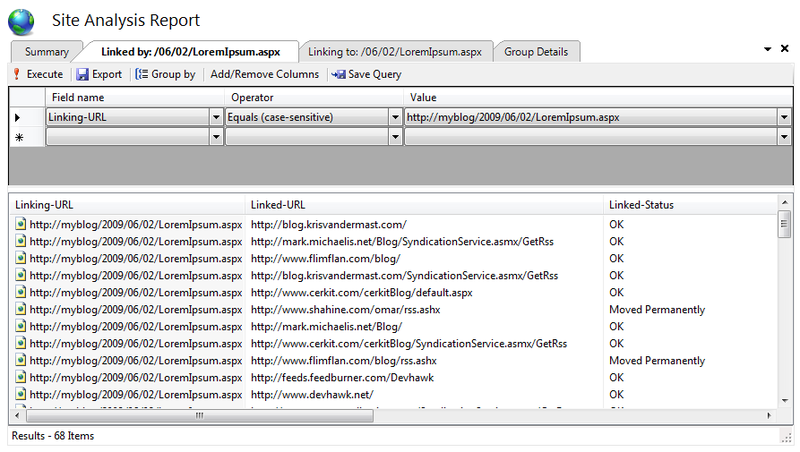 The IIS Site Analysis tool also lets you create custom queries on the data that was gathered during the analysis. Select the Server node or a site node in the tree view on the left, and then choose the "Search Engine Optimization" feature. You will see a starting page that allows you to look at analyzing your site, adding robots or sitemaps. Open the "Site Analysis" feature. This shows the list of all available analysis reports. 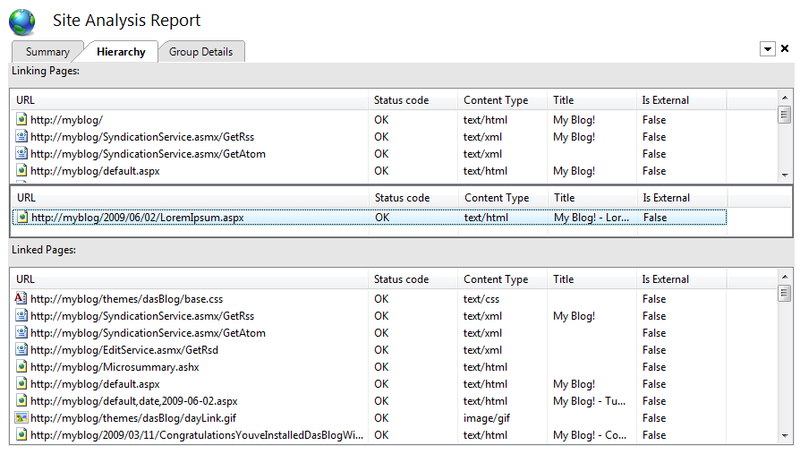 If you have not run any analysis yet, then click "New Analysis" on the right-hand Actions pane to create one. Select and open a report from the list of available reports. 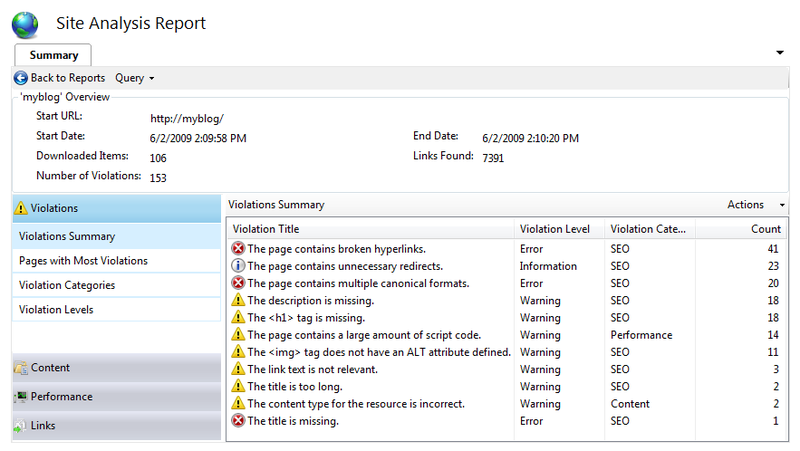 This will open the summary page for the report, which you can use to get a snapshot of all the SEO violations and content problems found on your Web site. Also, this page can be used as a starting point for getting to reports details. 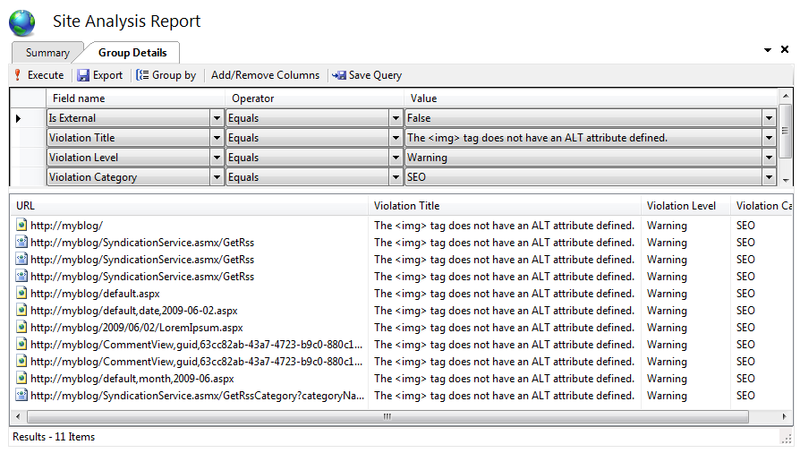 The site analysis summary page provides an overview of all SEO related violations and problems found on your Web site. 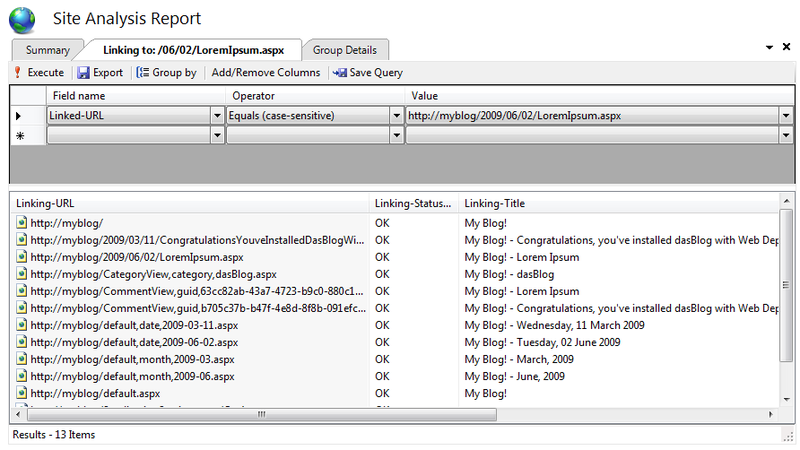 In addition, it contains a large set of pre-built reports about your site content and structure. Those reports can be accessed by using the navigation bars on the left side. 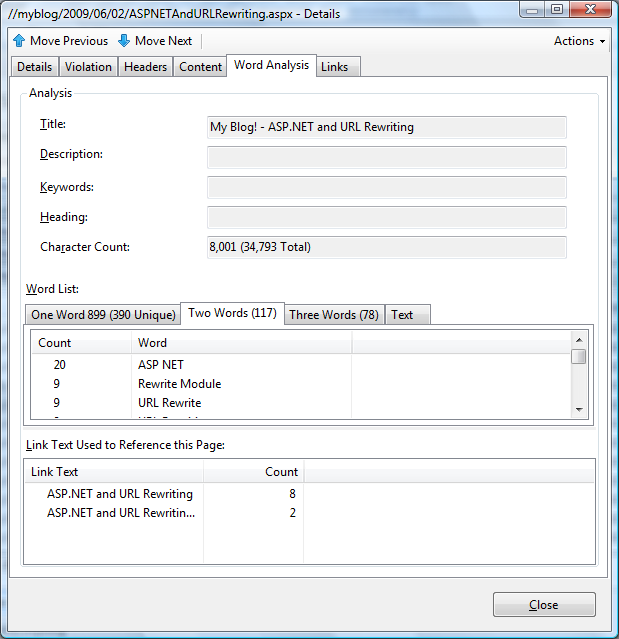 The query page is used to issue queries against the site analysis data that was collected during the crawl of the Web site. 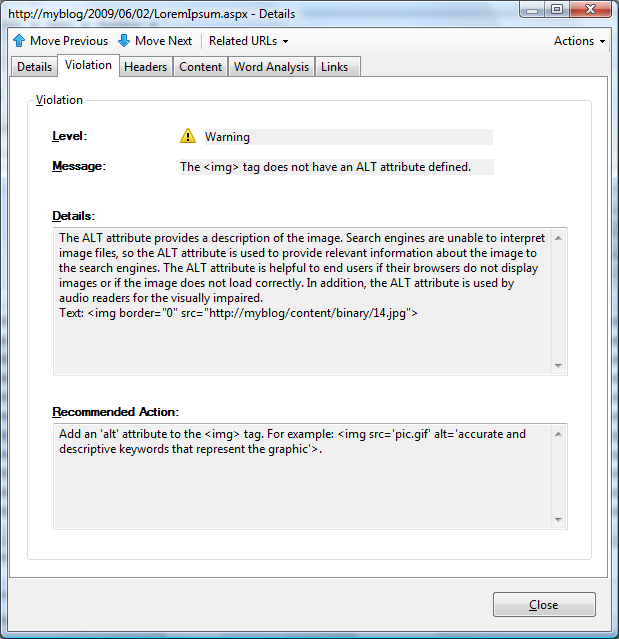 In the screenshot above, the query is used to get all the pages that reference images without specifying an ALT attribute within the <img> HTML tag. In addition, the actual response data is available if you need to further investigate the causes of the reported violation. For example, if you want to find out where in the response HTML this violation occurred, choose the "Content" tab. This will bring up the response content with the offending section of the markup highlighted. If you right-click a URL, you can select View in Browser from the context menu to show the URL in the browser. If you right-click a URL, you can also select View Pages Linking to This Page. This option will open a new query page that will show all the pages on the site that reference the URL for the selected item. This kind of report is useful when you want to find out which pages may be affected if you change a particular URL on your site. 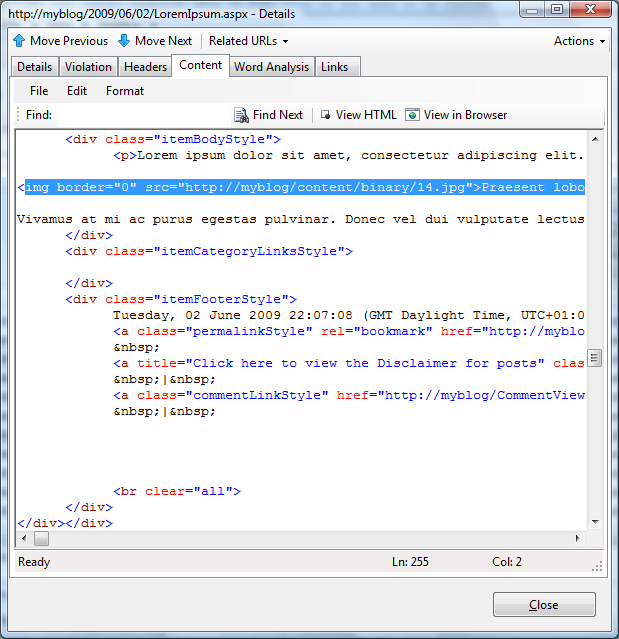 This option will open a new query page that will show all the URLs and resources that the HTML markup for the currently selected URL references. 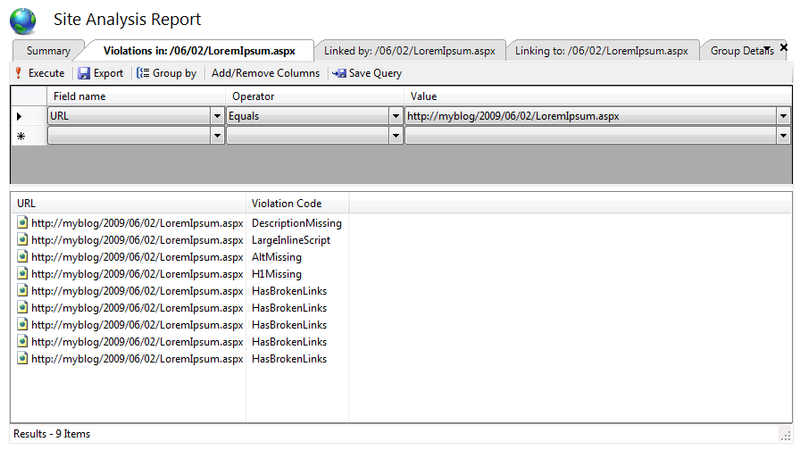 This option will open a new query page that will show all the violations found on the page of the selected URL. Double clicking on any item within the "Linking URLs" or "Linked URLs" list views will make that item a selected page and will update the linked and linking pages views accordingly. This option will open a new page which will display the 5 shortest unique routes from the analysis start page to the currently selected page. Each route is shown with the start page at the bottom, each subsequent page above, with the selected page on top. This report can be used to analyze how visitors can get to a particular page on your Web site and if there any unnecessary pages that can be eliminated in order for users to more easily discover the selected page. 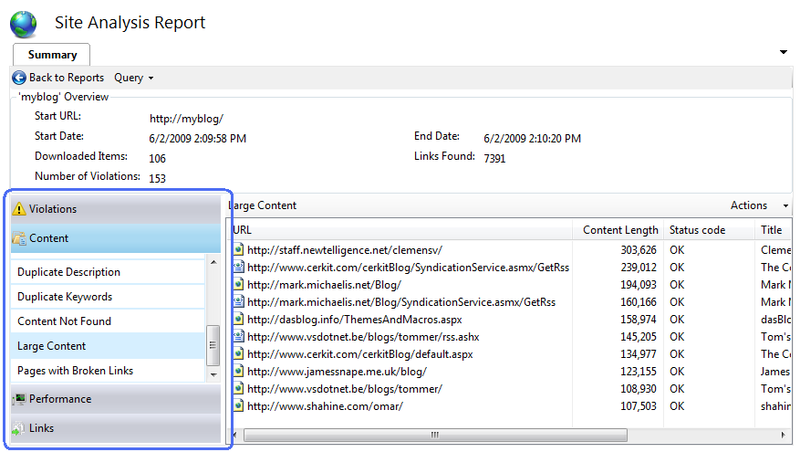 In any report, select the Web page that you want to analyze. 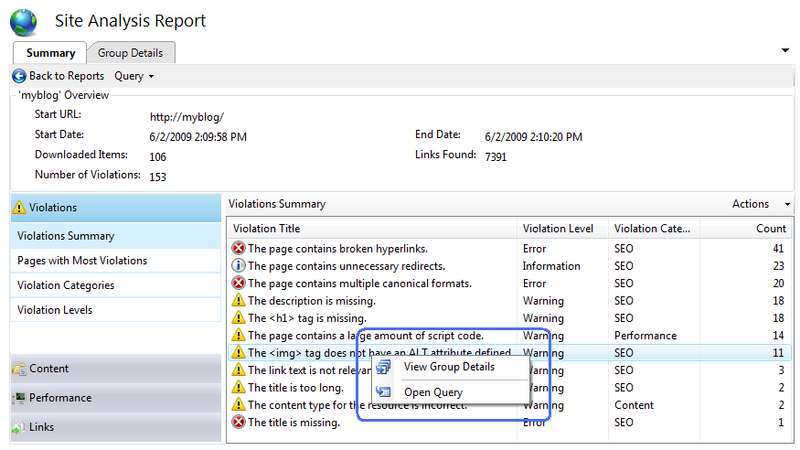 Double click on the row in the report to bring up the Details dialog. The most often used words within a page will be displayed, which can give you an idea of which keywords to choose for this page. 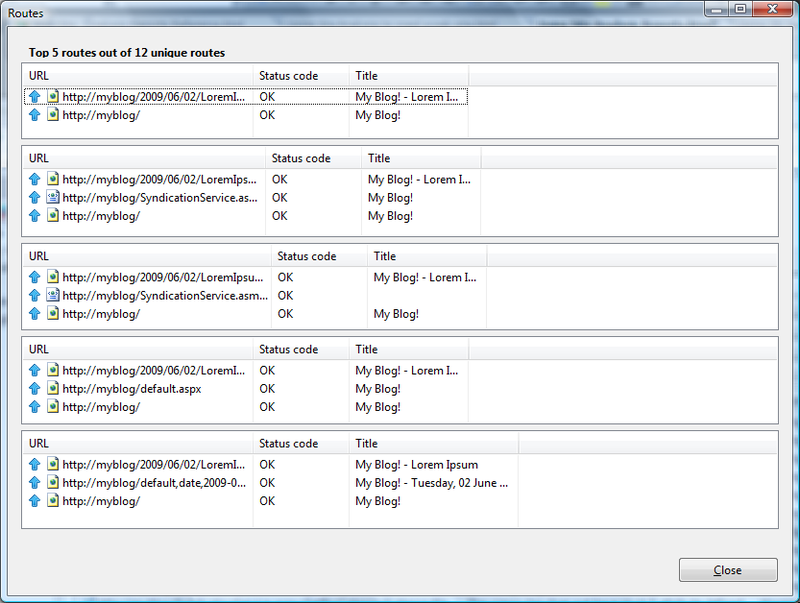 In addition, the text of links that reference this page are listed at the bottom of the dialog. This helps you to check whether the anchor text used within those links accurately describes the content of the page. The Site Analysis feature of the IIS Search Engine Optimization Toolkit is a powerful and flexible tool that enables you to perform deep analysis of various aspects of your Web site, from compliance with SEO best practices to content statistics, paths analysis, and selection of keywords.